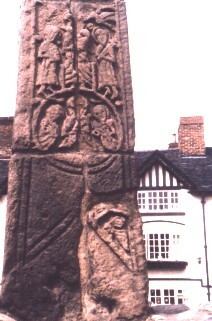 North Cross Shaft, East view, lower half. North Cross Shaft, East view, lower half. The cross is dated to the early ninth century. This section has the Transfiguration at the top. Christ is in the centre, and Moses and Elijah are on either side of him, New Testament, Matt 17; Mark 9:2; Luke 9:29; John 1:14. Below this under a circular arch there is a traditio legis scene. This is Christ with Peter and Paul. Christ is in the centre and he is giving the Keys of the Kingdom of Heaven to Peter (New Testament, Matt 16:19), and the New Law to Paul.